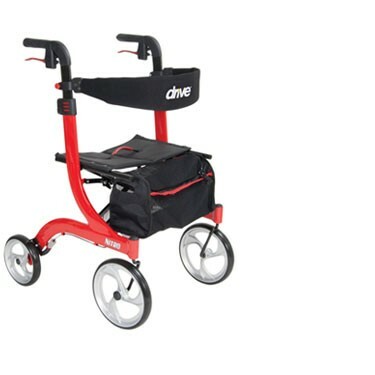 The Nitro Rollator is an attractive, Euro-style rollator with a body that easily folds with one hand to an ultra-compact size for convenient storage and travel. The brake cable is inside the frame for added safety, yet the handle height easily adjusts with unique push button. Caster fork design enhances turning radius. Large 10" front casters allow for easy maneuverability and indoor or outdoor use. Frame can be folded with one hand for ultra compact storage and portability. Back support height easily adjusts with tool-free thumb screw. Seat with fold-up handle is durable and comfortable. Cross brace design allows for side-to-side folding and added stability. Comes with a handsome removable carry pouch attachment that remains secure when rollator is open or folded. Ships in retail container and comes with a limited lifetime warranty. I liked mine & I bought one for my son. Pros:No dam cables on the outside. Cons:To small of a basket. Very slippery to put items on the seat area. Fantastic ,I feel safer. Today at CHurch every person on a walker at our elderly congrgation church , without exaggeration, asked about rollader and want one. Pros:safer, easier to manage as we load car and move about house. I am thrilled. 100% satisfaction on product and service. Strangers stop and want to know where I got it. It has become my cherished assistant. Pros:It's the greatest in its field. Cons:product arrived in a broken carton,which you claimed i listed above are you a middle man group ordering from the manufacturer? product arrived in a broken carton , for which you COULD NOT SEND ANOTHER went to ups,they could not help had to take a cab to BLUE RIDGE PKG & SHIP [FIRST HELPFUL GROUP TO AID ME!!!!] they were extremely helpful in the packing & shipping product back to the manufacturer NOT TO YOU P.S. are you people THE MIDDLE MAN BETEEN THE PRODUCTS & THE MANUFACTURER? Pros:Turns on a dime, does the usual narrow household halls without difficulty, is easy to fold, and it came in the box completely assembled. It work well outside though it is slow on grassy areas, rolls easily on cement and blacktop. I like the backrest with more support than the usual roll type. Brakes are easily applied. It is relatively easy to load into a higher SUV type vehicle. The construction appears to be sturdy and, while it appears to be heavy it folds easily and is not too heavy. I would not change the design or quality for a feature that may not be the best for the overall population who require walkers for mobitity. Cons:The seat would not fit an individual of more than 175 pounds or more but could still be used as a mobility device. The 18 pound weight of the product it a bit more than people with back injuries or other problems for lifting into a vehicle. It does take up quite a lot of space in the back or an SUV type vehicle and getting it up into the space behind the seat seems not to work. Handle Height: 33.5" - 38.25"